• Want to know what happened at the UFC meeting on the 14th? Want to know what happened at the UFC meeting on the 14th? I’m writing with a report on the University Faculty Council meeting held earlier this week. Because fewer than 70 faculty members and librarians attended, we did not make quorum and thus could not advance recommendations to Senate. However, both motions inspired good discussion. On the motion concerning the cancellation of classes in the event of a strike, the majority of members who spoke expressed support of the motion, mostly for the reasons articulated in the motion itself. Arguments against included that cancelling all classes would “deprive students of the right to decide” whether or not to attend classes, and that FT faculty’s cancellation of classes during a strike may render invisible to the public the distinction between FT and CAS, in effect concealing the exploitation of the latter. A vote was called, and the rough tally was 40 in favour, 10 opposed, and 10 abstentions. (I did not record the numbers.) Because we did not make quorum, the vote was for information only and could be used to advance a recommendation to Senate. The motion concerning governance review generated much broader support. Several members expressed their frustrations by the fact that the governance review of Senate was foisted upon Senate without Senate’s consultation and approval. Anyway, the final tally was roughly 60 in favour, exactly 0 opposed, and a few abstentions. 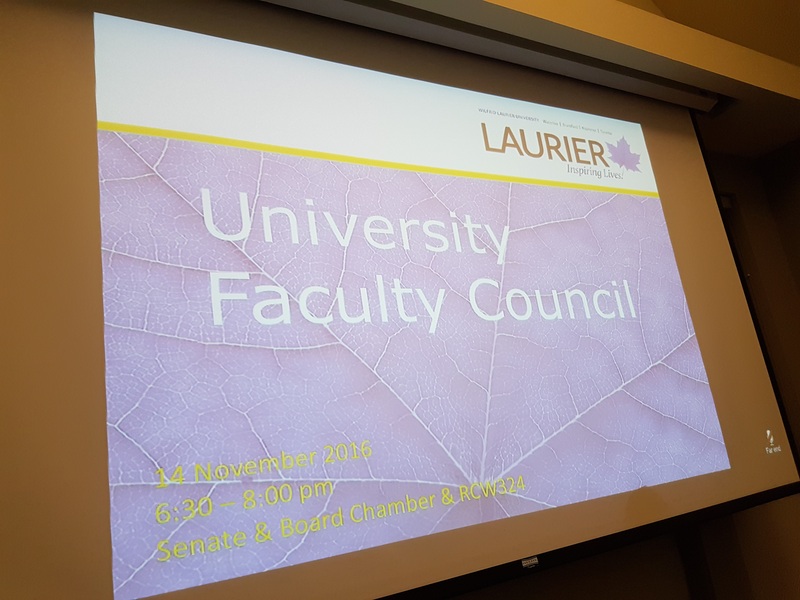 One of the points raised with respect to the governance review, and in particular the motion’s attempt to increase the number of faculty members on the BoG and Senate, is that faculty members are already hard-pressed to engage in administrative duties. I suppose the evening’s dismal attendance was evidence of that point. Garry Potter, who led the both motion discussions, also provided a follow-up to the meeting, from his perspective. We’ve posted this on the WLUFA Advocate Blog under the title he’s provided: The UFC: Cynicism Versus Optimism of the Will.